Berkeley likes to tout itself as a forward-thinking haven. Its politicians and public figures pay lip service to progressive ideals. So let’s take a quick look at the city’s track record on adequate police oversight. In June 2016, Councilmember Kriss Worthington brought an agenda item to Berkeley City Council that would create a ballot measure adjusting the city charter and giving more power to the police oversight committee. Back then, Mayor Tom Bates was running the meeting and, in typical Bates fashion, he placed the contentious item at the end of the meeting agenda. He later postponed discussion on the proposal not once, but twice, before finally letting the proposal die when the council left for recess and missed the deadline to submit ballot measures for the then-upcoming local election. So as City Council failed to give voters the chance to demand more police accountability, Oakland officials approved a similar proposal, got it on the November 2016 ballot and saw voters overwhelmingly approve a major revamp and empowerment of their police review commission. And Berkeley’s Police Review Commission, or PRC, is in desperate need of revamping. As it stands, the body is toothless, with virtually no means to act on troubling trends or incidents within Berkeley Police Department. In the past, Mayor Jesse Arreguín has completely disregarded the commission, failing to ask for its input when rushing to pass an overzealous policy to allow BPD to use pepper spray. The commission’s findings that Berkeley police officers stop and search Black residents more often than white residents came and went with little movement by city officials to pass new reforms. Recently, Worthington sponsored a proposed ballot measure to replace the existing PRC with a new independent entity to oversee police actions. The new commission would be able to initiate its own investigations into police conduct, and it would have greater power to force changes within the police department without City Council approval. You’d think a push for more police oversight would fare better this year. A progressive majority took the council in 2016, and Arreguín seemed to share Worthington’s concerns about the way Bates organized his meeting agendas. But it’s been more of the same. At its last meeting, the council decided not to discuss the proposed item — and instead postponed it indefinitely. What trash. 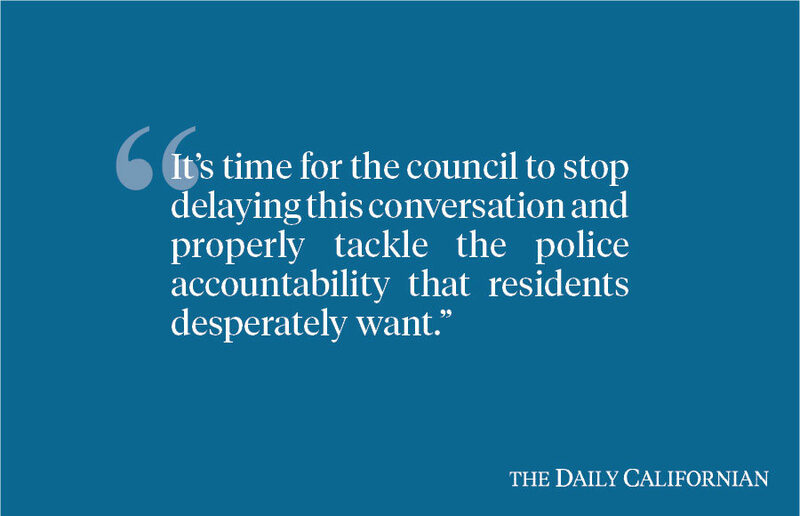 It’s time for the council to stop delaying this conversation and properly tackle the police accountability that residents desperately want. This commission has the incredible capacity to shed a light on the department’s failures and missteps. It was the PRC, through a 2014 investigation into the in-custody death of Kayla Moore, a Black transgender woman, that found that one officer exercised improper police procedure. But without the authority to act on its discoveries, the PRC can’t be the effective oversight body it was meant to be. The proposed ballot measure isn’t perfect — giving a member-appointed body the power to fire police officers at will without any City Council oversight, for example, is excessive. And most PRC members don’t agree about whether it’s a worthwhile solution. But this effort comes from a place of need, and the least City Council can do is discuss it. City Council is just burying its head in the sand hosting town halls and making hollow statements of support. It’s time for the council to actually walk the walk.